After an evening and night where the rain lashed down over London, 4.00am soon arrived where the bleary eyed Peaky Climbers were treated to a quality breakfast spread by Ollie, Johns nephew, who had just returned from a London nightclub. 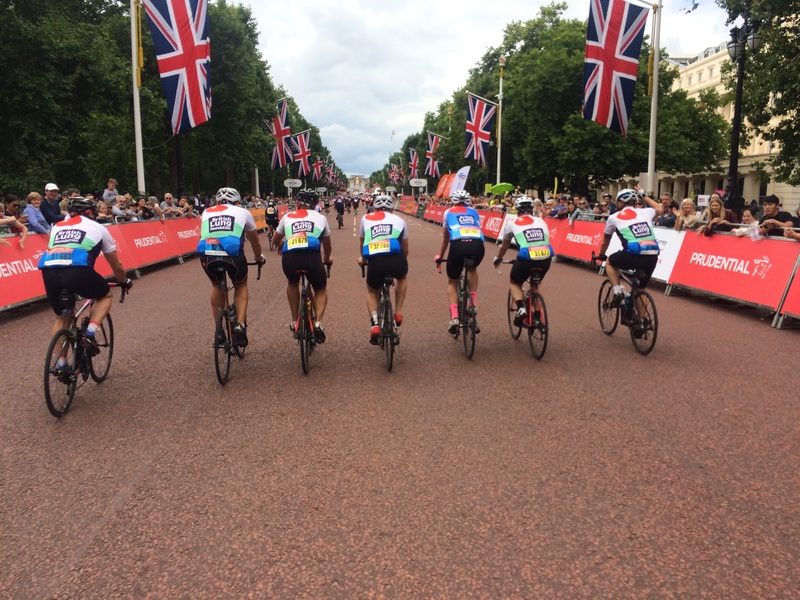 With water bottles filled, race numbers fitted, last minute checks completed and the rain now finally stopped the Team headed off in high spirits to ride the 6 miles to the Queen Elizabeth Olympic village to start line. Having arrived at 5.45am, the Peaky Climbers set off from the Yellow start Wave B at 06:30am with Celeb rider, Martin Johnsons music dedication, That’s Entertainment from of The Jam blasting out of the speakers proving popular with ‘middle aged spread’ race team(s). A fast-average early pace, which was very fast for JB and Macca, saw the Peaky Climbers speed through the opening 30 miles going past the Tower of London, past St Paul’s and out via Knightsbridge then covering Chiswick, the beautiful Richmond Park, Kingston upon Thames and Molesey, ignoring evert traffic light and using major A roads as the event was on a fully traffic closed route, which was awesome. This is where the 46 mile route split, obviously the Peaky Climbers pushed on to the Surrey Hills on the 100 mile route. The average speed kept up all the way to the Surrey Hills. With food and drinks being consumed as we cycled, the team was looking in fine form and very impressive in their British Lung Foundation & Caring Cancer Trust branded team jerseys. The first of the 3 major climbs is Newlands Corner with an average gradient of 5% for a mile or so, peaking at 11%. Once at the top, the views over the stunning North Downs early on a Sunday morning were beautiful. After a slight misunderstanding re ‘pit stops’ the guys re-grouped a couple of miles down the road and pushed on to the biggest climb of the day. Cricky had a brief puncture, but otherwise the entire team were very fortunate…no mechanical issues. The only slight blott on the day was the odd crazy so called ‘semi-pro’ cyclists that were steaming past on the right, and one damn fool who came round a corner so quick it was easier for him to crash into Cricky at high speed opposed to missing him, fortunatley a nasty incident was avoided! The boys were loving the ride. The crowds were fantastic, shouting and clapping encouragement all along the 100 mile route which was hugely inspiring. Guest Peaky, Kevin Sanders, drove the pace on out front together with Graham, Simon and Cricky. Allen, Ben, JB and Macca kept the peleton moving, taking it in turns to do their bit. Leith Hill hits you at around 55 miles and is iconic as it’s the highest point in South East England. Peaking at 15%, the average gradient is 7%, this combined with the narrow roads and lot’s of cyclists climbing up it today made for an interesting climb. Some participants found the going tough and were walking up, some pushing hard and slowly arriving at the summit, the Peaky Climbers with all their training rode up on the speedy right hand side, with no troubles at all. Well done boys! A 40mph decent, avoding pot holes and riders, meant we sped on to the final climb of the day, the famous Box Hill. The zig-zag climb is well recognised from the 2012 Olympics, however it’s only a 4% average gradient and not that long a climb…but the views are superb once at the top and seeing spectators line the banks and summit was brilliant. It was then downhill and the cycle back towards London. 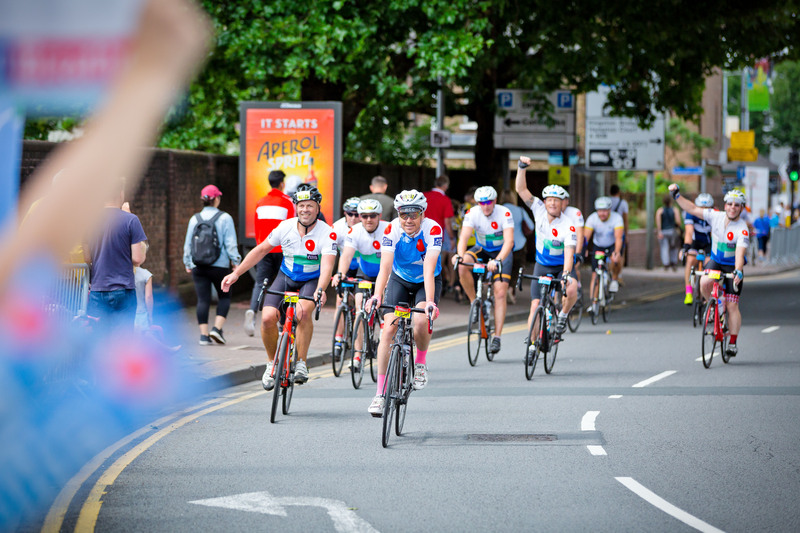 Dorking was packed with people and the Peaky Climbers ‘whipped’ up the crowd as we cycled past – much holloring and cheering – fantastic experience! We flew into Kingston and spotted the British Lung Foundation entourage whereby all the Peaky team slowed up, cheered, shouted and raised fists aloft in celebration…the BLF team were fantastic in their support, even shouting “Come on Peaky Climbers” as we flew by! After the cheeky elevation at Wimbledon Village the boys were now in a fast 8 line peleton, speeding rapidly to the finish line. ‘Woo woo’ was shouted as the Peaky train shot through Putney and onto the Embankment then finally onto the Mall, with the finish line in sight. All the boys lined up as a team of 8 and crossed the line as one. Phenomanal. Next week…back to local training!